I have months – ok, years – of back logged “notes to self” sitting at my desk. They are things I know I should look into and handle. Website optimization, insurance coverage, websites I should visit, etc. I’m actually making progress through the pile, but had to stop and tell you about the last note I just tackled. You see, it was one of those “OMG, every quilter needs to see this” moment!! 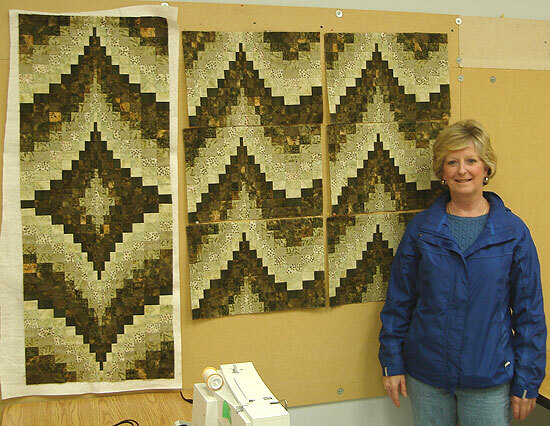 Marci Baker of Alicia’s Attic – http://www.online-quilting.com/ – has made some professional videos on quilting, some of which are available on YouTube. Well, the one that struck my fancy this afternoon was the one on “different” angles of mitered binding. This is the season customers are making table runners for gifts, many of which have angles that are not 90°, creating a binding experience that lasts longer than the piecing. Wasn’t that absolutely enlightening? So after I watched it, I then experienced the “Will I ever find it again?”, “What if she removes it?”, “What if YouTube sells out to the Chinese ” kind of angst. You see, I love to own the information – not just hope it will always be there for my reference 5 years from now. I still love paper and back-ups. Well, god bless her, Marci has made available downloads of this video, and an accompanying pdf file for those nights the computer is turned off or I’m at a retreat (wishing). And not only that, Marci did not stop at explaining outside angles other than 90°, she made a video and pdf available for inside corner angles as well. I downloaded both of them, quickly printed out the pdf’s for myself (just in case the computer crashes or something), and am giddy with finding this information to share with you. And no – I don’t get a commission! Linda – Hey, let me know if you liked her Mitered Binding for Different Angles video. Take the poll – it’s always neat to see what others think! 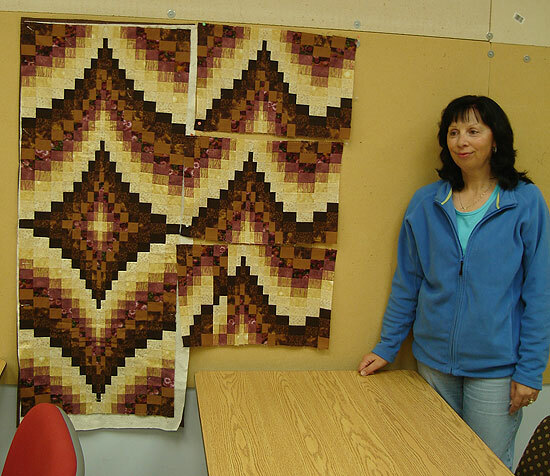 A great introduction to Bargello is making a pattern that is, essentially, bargello-by-the-block. And in the case of our Bargello Table Runner and Placemat’s class, that is what you are doing. 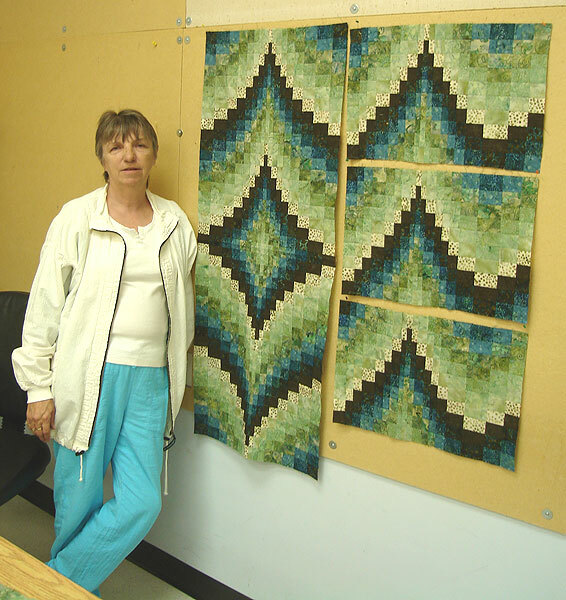 These are designs from the book, Twist-and-Turn Bargello Quilts by Eileen Wright, a fellow Candian!! 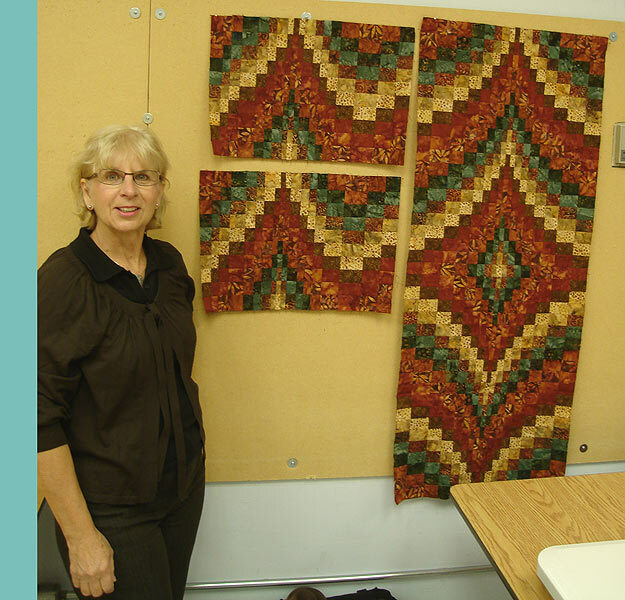 Leslie recently finished teaching a session of our Bargello Table Runner and Placemats class, and from the pictures below, you can see there will be some well-decked out tables in the city! There has been some confusion regarding the parking at the store, and the previous signs for visitor parking were rather befuddling to many. However, this has been resolved, and I am posting here for all to read and see, just what the parking is. All Evenings & Weekends (Both Saturday & Sunday) – If you are visiting us on an evening or weekend (both Saturday & Sunday), we have the parking lot of dreams. You can park anywhere. Really. We are the only place open, and the lot is ours. Does it get any better than this? We’ve had family members get out of the vehicle and play lacrosse, while quilting mom shopped. Again, really. Daytime Monday-Friday – There is parking in front of our store. And then, directly across from our store, is an entire row of Visitor Parking, which now is clearly marked with signs stating as such. It is a rare day indeed that this parking is full with visitors, but if this still isn’t enough there are way more Airstate Visitor stalls (which can be used) down at the north end of the building, and I’d be happy to tell you where they are. 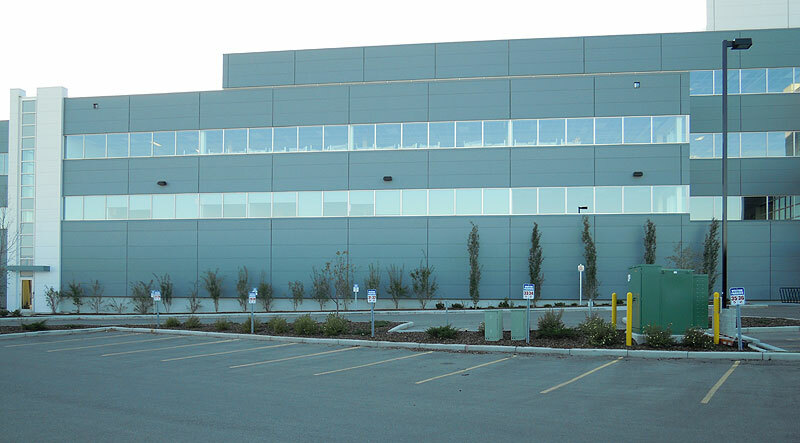 Below is a picture of the parking directly across from our store. Should you be taking a class from us at the store during the Daytime Monday to Friday, we ask that you unload at the front of our store, and then park your vehicle in this Visitor Parking. Finally, should you still be confused where to park, just park somewhere and come in and ask us. We’ll be happy to show you. At one time we advertised this class on our washroom door. The staff took a certain amount of glee referring a customer looking for the biffy to find it behind the Strips ‘n Curves sign. That’s how we get our jollys some days. Don’t want it to be boring. 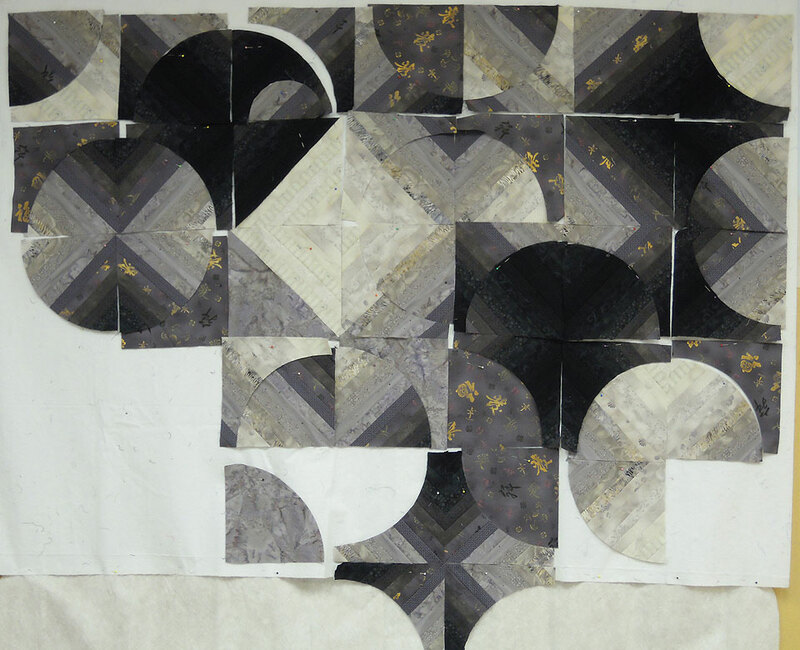 While we currently don’t have a class being offered on this technique, we just finished one in September, and I’ve uploaded some of the students’ work to our Gallery, Quilts from the Classroom. And, to make it simple for you, I’ve posted them below. 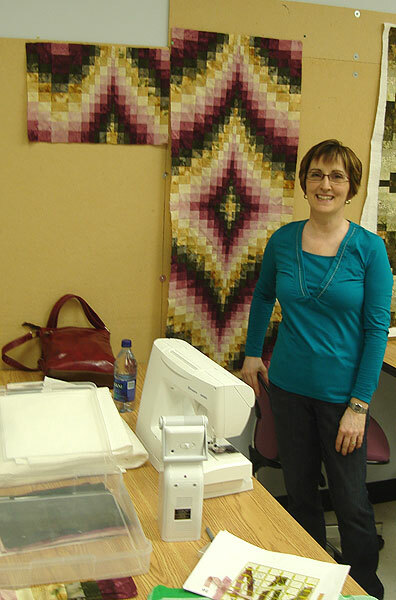 Kathy L’s Sample focus fabric was an asian fabric, and she picked colours from it to create her strata. Pat K. wanted to create an interpretation of a beach scene with sand, water, and sunset. This is the part that is more “sunset”. Shari B’s focus fabrics were the main print from Northcott’s Oriental Odyssey and a coordinate. They have a lovely metallic wash over them, and her strata colours were pulled from it. Mary T. picked a very subtle Asian grey fabric for her focus fabric, and we pulled a strata from light grey to black to match. This was a full class for us, but I only got into the classroom with the camera at the end, so I missed out on taking pictures of 6 other quilts. I’m hoping the customers come back and show us their finished tops. 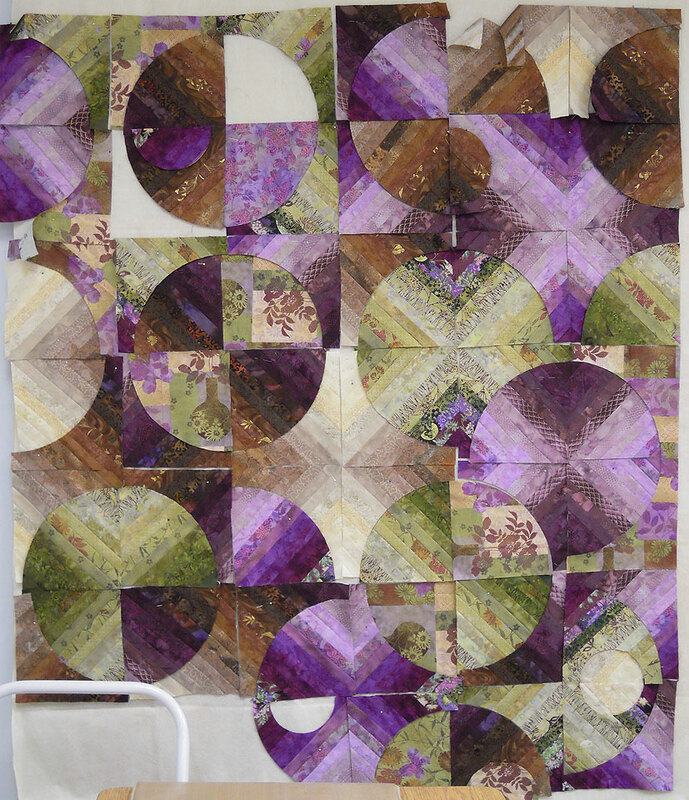 These quilts are all made using Louisa Smith’s book Strips ‘n Curves as their inspiration, and utilizing her templates. 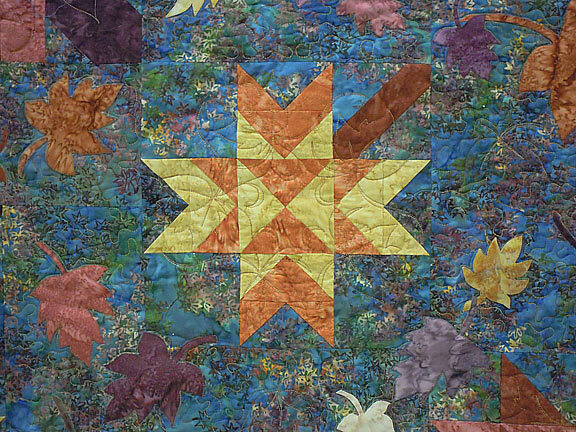 If you want to see more of this quilt artist’s work, visit her website at http://www.quiltescapes.com/ or her blog at http://louisasmith-stripper.blogspot.com/ . Next class semester we will be offering an advanced strips ‘n curves class for those students who have taken the basic class already with us. Kim has been planning it for some time and I know the quilts made in it will be just as gorgeous as all the ones we’ve had in the beginner class. 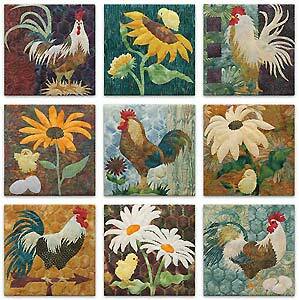 Oooh, this is one of my favorite quilts. It’s had been hanging in the store, with the binding just machine basted, so I got it done and finished stitching it by hand. And, no, I don’t see this as a chore; I rather love sitting and doing the hand stitching of binding. Maple Swirl is my own design and pattern. 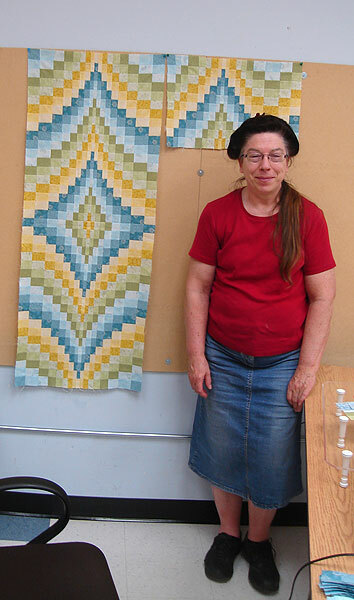 We previously offered it as one of our Saturday Block Bonanza quilts in the shop from March of 2009 to February 2010. I’ve now uploaded pictures of the finished quilt and changed it on-line to a regular Block of the Month for on-line participants that includes the finishing kit in the price. All the fabrics are batiks and bali watercolours. 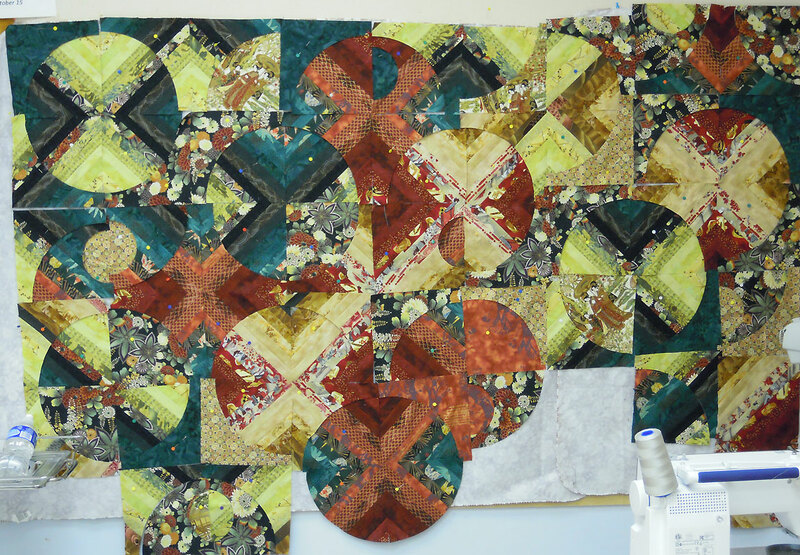 The pieced blocks are fairly easy, and the applique is done with fusible web and machine stitched down. I used 100 weight silk thread with a 70 microtex needle, and a small zig-zag for the stitching around the leaves. The silk thread was used in the top and bobbin, and five different colours were used – YLI numbers 226, 227, 228, 233, & 256. 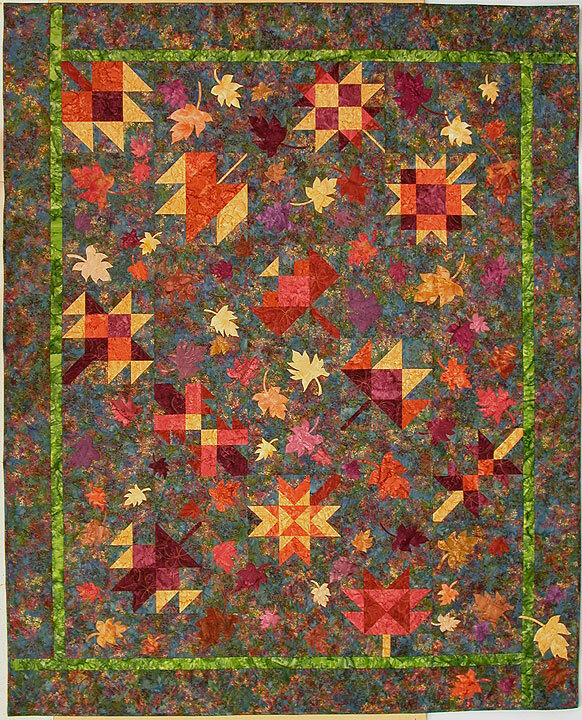 Jane Goddard did a wonderful job quilting a maple leaf block design in the pieced blocks and the border, and a stipple and the odd matching maple leaf around the applique. 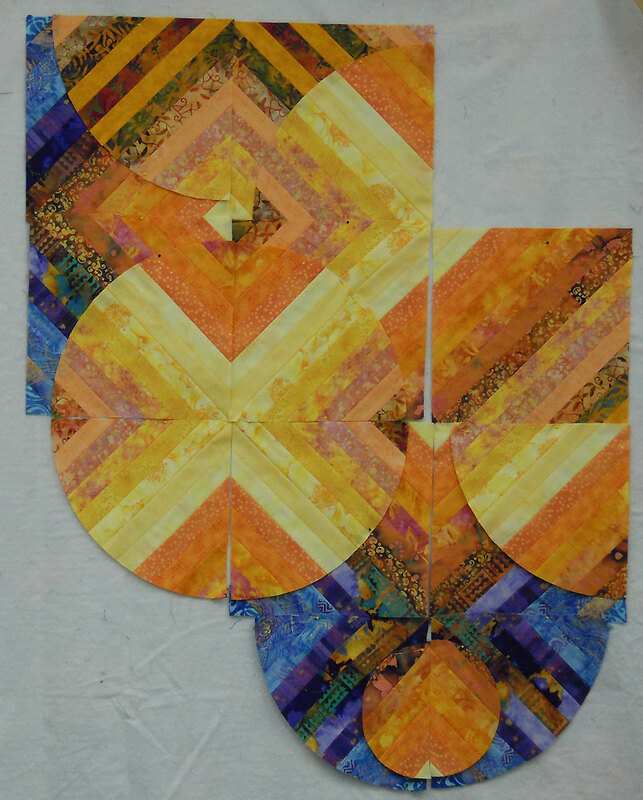 King Tut thread was used for the quilting in colours 911 & 933 for the top, and 933 for the back . We’ll be hanging it once again in the store and this is the right season for it! Just in time for Halloween. I imagine Blood Red is their favorite colour. Hey, if you would like a copy of the book, I’m happy to order it for you. Just send me an e-mail. 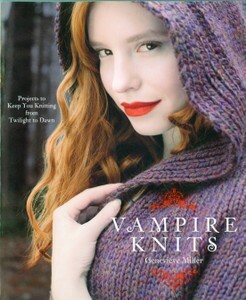 Vampires and friends deserve knits too. Now that we are no longer Cooped Up, Kim is busy working on the measurements of Beach Walk, a new BOM by McKenna Ryan. We want to make sure the suggested cuts will work for the customers. Once we have worked through the 9 patterns, we’ll be able to price it and make it available for sale. I fell in love with the gorgeous printed cottons by McKenna Ryan that are the main focus of this program. Matter of fact, there are very few batiks and bali’s used in this program. And it is no where near as complicated as In Full Bloom. 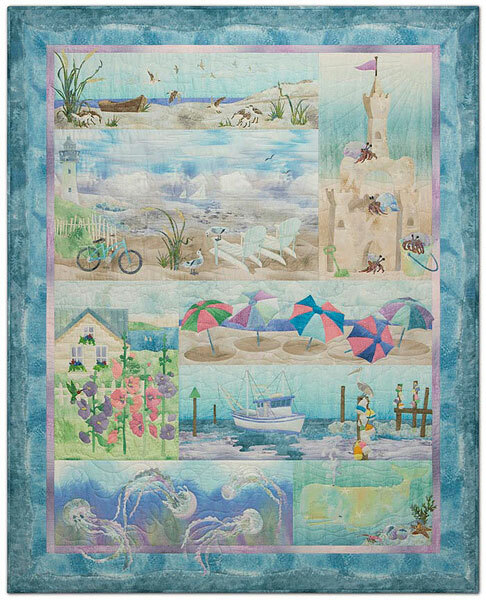 This soft seaside quilt absolutely took this prairie girl’s heart. I knew we had to offer it. There must be other prairie girls in town that are dying for a seaside retreat.